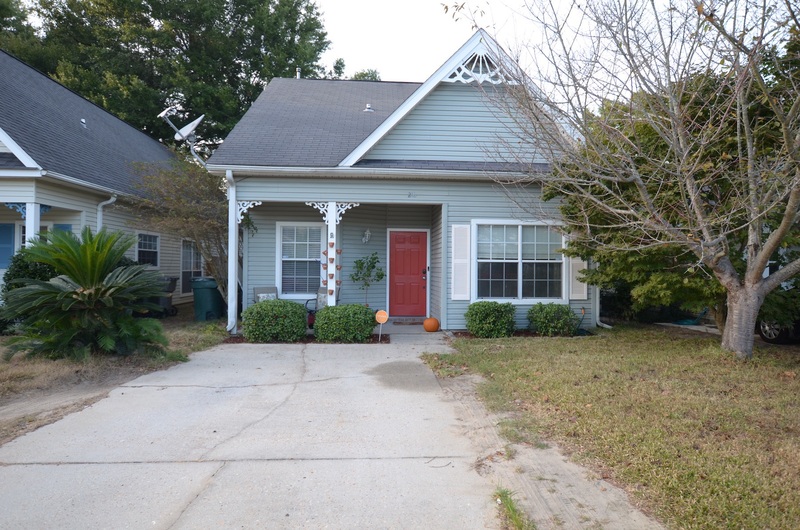 Welcome to this adorable 3 bedroom 3 bath home for sale in Cottages in Grandpointe, located just off of Scenic Highway in desirable Northeast Pensacola, FL. As you enter this home you will notice that it has a spacious feel. The kitchen is really a nice size with a great layout. There are plenty of cabinets and lots of countertops for workspace. Having a pantry is a bonus and could be used for extra storage, if needed. There is a hop up bar that would be great for breakfast on those rushed morning Just off of the kitchen is a nice size dining room that would be great for family gatherings and entertaining. The family room is large with laminate floor and has a ceiling fan. There is a guest bathroom on the first floor. The master bedroom is also on the first floor and is really spacious. It feels very roomy and features a ceiling fan and large windows that is great for natural lighting. The master bath is good size. There is a bedroom downstairs that would make nice size guest room, nursery or a great office, if needed. Upstairs you will find a large bedroom with lots of closet space. There is a really nice size bathroom upstairs also. The back of the home has a 12X8 covered patio that is great to sit and watch the children play in the fenced back yard. Desirable location, conveniently located close to the malls, shopping, hospitals, restaurant, school I-10 and BEACH. This is a family friendly community with 2 parks. This is a great house to call home. Call to make your appointment before it's gone! Add this adorable home to your list to see today. You will not be disappointed that you did! Call or text Anita for more information and to see if this home is still available…850-377-4410. I am also available to assist buyers with other listings in the Milton, Pace and Pensacola area. Let me tell you how you can BUY with less money out of your pocket! View Additional Homes for Sale Pensacola FL. If you or someone you know is thinking of selling your home, I would love the opportunity to meet with you and go over my marketing plan and show you how I can get your home sold in a shorter amount of time. My marketing will get your home SOLD. If you are thinking about selling Click Here for a free CMA to find out what your home is worth. Thank you for reading about this 3 Bed/3 Ba Home for Sale, Cottages in Grandpointe Subdivision Pensacola FL!